This advanced systems thinking course teaches you tools to uncover practical approaches to applied systems thinking to affect positive change. In this class, you will learn to see critical relationships, understand feedback loops, and conduct consequence analyses. You will also establish causal relationships and gain radical insights into systems dynamics. In the previous courses you will have gone through different approaches to identifying, understanding, and mapping systems and problem arenas, in this one, you will gain a deeper synthesis of how all the components fit together. 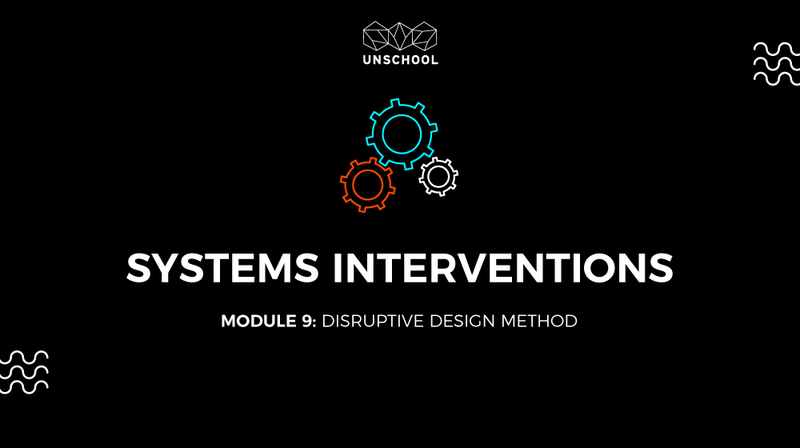 The tools gained in this course will prepare you to identify where and how to intervene in a system, build effective systems interventions, plus design systems in which these interventions can exist. Develop advanced systems perspectives and the ability to develop tactical tools for affecting change. Unpack mechanisms, models, and mechanics of making change, specifically developing a theory of change and deeper systems thinking. Gain skills in deeper synthesis of all the components of the identifying, understanding, and mapping systems and problem arenas. Create a strong foundation for building effective systems interventions, and design systems in which these interventions can exist. Welcome to the Systems Intervention Course! Where and how do you intervene in a system to create change? If you have been taking the previous classes that unpack the Mining + Landscaping phases of Disruptive Design, then by now, you should have a much deeper understanding of the dynamics of the various systems in the world around us. So now, the goal is to identify the non-obvious elements, connections, and aspects of the systems that you have been exploring, in order for you to begin building interventions that leverage change. In this advanced systems thinking knowledge session, we give you the tools to go deeper into the system's dynamics, to gain a more granular understanding of the phenomena that are at play in the systems, and to decipher interventions points of leveraging change. Through then identifying some critical insights, you can start to move into a rapid ideation phase. Through this session you will get to explore where and how to intervene in a system to create change. This advanced systems thinking class teaches you tools to uncover practical approaches to applied systems thinking to affect positive change. In this class, you will learn to see critical relationships, understand feedback loops, and conduct consequence analyses. You will also establish causal relationships and gain radical insights into systems dynamics. Taking all of the new knowledge covered in the first series of classes, you will learn to apply them to project design as a critical part of the Disruptive Design Method. While you would have been going through different approaches to identifying, understanding, and mapping systems and problem arenas throughout the previous classes, in this knowledge session, you will gain a deeper synthesis of all the components put together. You will be able to identify and build really effective systems interventions, plus design systems in which these interventions can exist. We will also unpack mechanisms, models, and mechanics of making change, specifically developing a Theory of Change. Let’s do it!